Hot drinks are a must for all ages learning outdoors at this time of year. 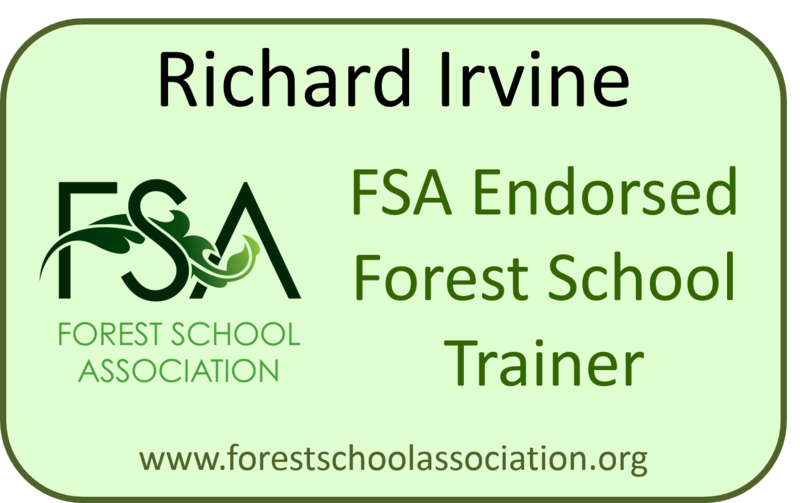 A communal drink break is part of our Forest School routine whatever the weather and on really cold days or for end of term treats, I sometimes break out the hot chocolate. If making real hoc choc with milk, then a whisk is essential and provides an opportunity for a bit of authentic needs based learning. 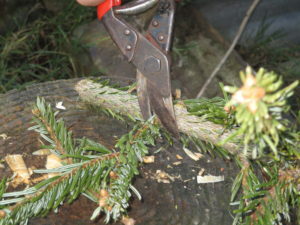 It might be a little bit late on the 9th January but if you can find a Christmas tree to recycle then you can have a go at making your own – it is really easy. This design is likely as old as humankind and is still used where conifer trees are common. 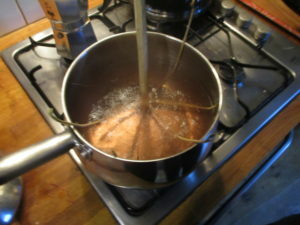 a brief bit of research found that in Sweden they are called Grötkräkla (a porridge whisk – which in Scots would be called a ‘spurtle’ though I haven’t heard of a Scottish one with branch stubs) ; in German, Astquirl (branch whisk) and in Norway a Turru . Large versions of these were traditionally used in cheese-making to cut the curds. Every year on various greenwood craft and whittling Facebook groups someone posts a picture of their Christmas tree whisk and this year I had a go and did a little experimentation. There is some good information in chapter 30 of Drew Langsner’s excellent book Country Woodcraft and Felix Immler of Swiss Army Knife fame has a good youtube video of his version, though the process I played with varies considerably from his. 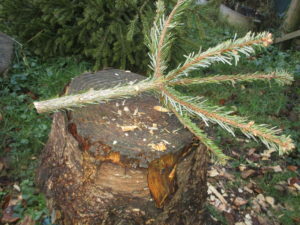 I found 2 Nordman Fir trees put out on the street by my neighbours for recycling – once you have sourced your tree, you can follow the pictures and descriptions below to make your own. 1. 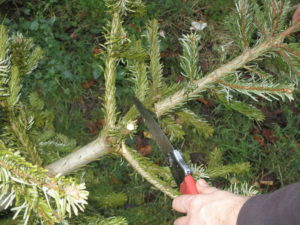 Cut the stem to include the top whorl of branches and a decent length of handle. 2. Remove any lower branches that are not going to be part of the whisk. 3. Decide which way up the whisk will be. 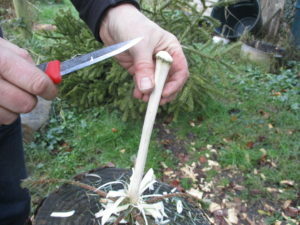 I chose to bend the branches down the stem as it meant I had a larger diameter piece of wood to use as the handle. 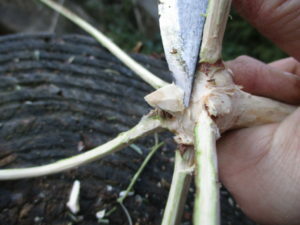 Then cut off the part of the stem that you will not be using leaving a few centimeters near the whorl of branches to carve to a point. 4. Peel all the bark off. I scraped the needles off first with the back of a knife so that I could see what I was doing. Peeling would be really easy in Spring time but is a sticky, fiddly job in January. Try not to cut into the wood and don’t worry if you don’t get it all off. It will be easier to get off any little bits when we boil the whisk. 5. Carve the handle to a shape that you like. I wanted a bulge at the top and an octagonal section handle to make it easy to twirl (or quirl if you speak German). Carve the stub of stem left below the whorl to a point to make it easier to spin on the base of the pan. 6. 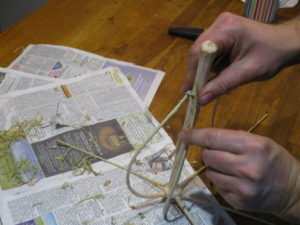 If possible, bend the branches up the handle and bind them to the handle with string to form the balloon of the whisk. If this is not possible then jump to stage 7 first. It is wise to go easy at this point and not force the branches to bend too much. 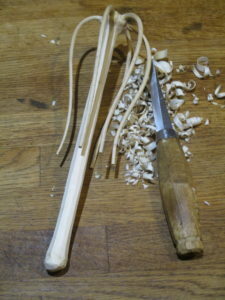 It will be possible to increase the bend and play with the shape when the wood is boiled. 7. Put the whole thing in a stainless steel pan of boiling water with the lid on of possible. Let it simmer for at least 10 minutes. The water might turn pink and smell like radox! 8. 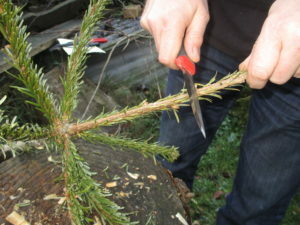 Remove from the hot water and pull the ends of the branches up through the string to make the branch bend more and the resulting balloon smaller. At this point is should be easy to scrape any remaining inner bark from the branches using the back of a knife or even thumbnails. 9. 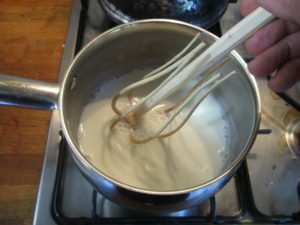 Repeat this process if you wish and adjust the shape of the whisk. I used a narrow mug as a mold for the hot wood and let it cool and dry there for some time. 10. 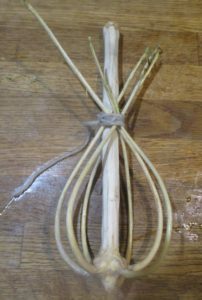 When the whisk is cool and dry you can remove the string and trim the branches to an even length. Keep the balloon shape or go for traditional shorter stubs. You could sand it smooth and treat with a food safe oil. I left as is and am assuming that the caesin remaining from each whisking will seal the wood adequately. 11. 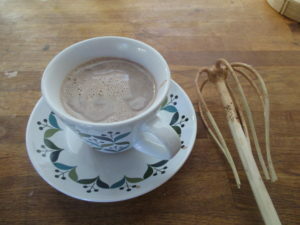 Make some hot chocolate with whole milk and good quality dark chocolate pellets. 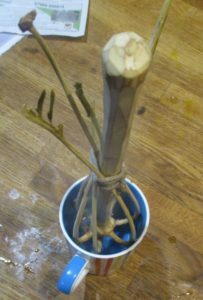 So far I have found that the steam bent branches open out quite alot in the hot milk but return to shape in step 10 once cool and dry. 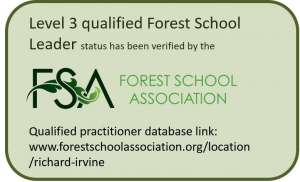 If you were able to source enough materials this would be a great craft project at Forest School. If you have a go then please let me know how you got on.